This is, arguably, one of the greatest books ever written and even if you disapprove of everything that Hemingway ever did, you have to read it before you die. 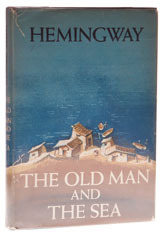 This story was really close to Hemingway's heart, it took him decades to write it and there isn't a word out of place anywhere. The prose is just about perfect and the characters are drawn so well that you want to get out there and pull with them as the giant marlin fights so long into the night. Papa based this on a fish he caught, probably in the thirties, and stuff he saw out in Cuba, but how he managed to transform his experience into this epic struggle between a defeated old fisherman, a young boy and a record marlin, I have no idea. Genius on the page - this would be on my list of desert island books.